Home gardeners can do a lot to address global climate change. Options include everything from choosing self-reliant plants that need less water and fertilizer to reducing energy use by trading in mowers and blowers for rakes and hand clippers. 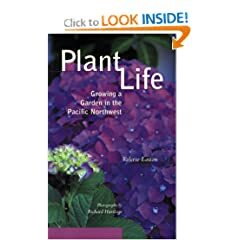 Easton has written several great gardening books! You can find them at local book stores, or on Amazon.com. Join National Wildlife Federation and Woodland Park Zoo for a special event about gardening and its important role as a solution to global warming. Attention about this worldwide issue is growing, and it’s time for gardeners to take action.
. Hear from experts about the impacts of global warming on the environment.
. Real solutions for how gardening can protect plants and animals.
. Network with other like-minded gardeners and plant enthusiasts.
. Tips to strengthen and beautify your community.
. “Become a Trainer” session after the lecture. Take the next step in your commitment to gardening. Stick around for the “Become a Trainer” session after the lecture and learn how to give the Gardening and Global Warming presentation. Educate the members of your community about this growing threat to plants and wildlife. Do the teensy-tiny green things you do actually count? Oh, great email/post from the Ideal Bite crew on Friday. I am still catching up on all my reading. Read Do the teensy-tiny green things you do actually count? Ever feel overwhelmed the by the amount of waste you see being generated each day? Then we invite you to become a key partner in Seattle’s waste reduction and recycling efforts! As a Master Composter/Soil Builder you’ll learn the techniques of turning your food and yard wastes into compost, an amazing additive for organic gardens that keeps carbon in the ground and out of the atmosphere. You’ll learn the finer details of Puget Sound’s organic recycling programs, and discover how to assist your family, friends, neighbors and the public at large in adopting practices that conserve resources and build soil. The Master Composter/Soil Builder Training will take place over a 3 week period in late March and early April of 2009. Class sessions are held Wednesday evenings and Saturdays. As a program based in public outreach, we ask that Master Composter/Soil Builders complete 40 volunteer hours by April 2010. All Seattle residents are invited to take part in the MC/SB program. Call 206-633-0097 for an application or visit www.seattle.gov/util/services/yard/composting. Steve’s borrowed some great camera equipment from his dad while he is back in Mnpls, so he has been able to get some great shots of the guests we have visit our deck-bound wildlife habitat. 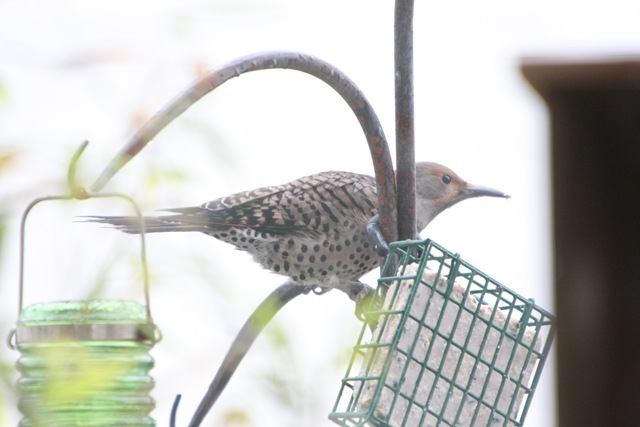 We’ve seen my favorite black-capped chickadees, junkos, flickers (a type of bug-eating woodpecker, does not damage houses or trees), and an Anna’s hummingbird (maybe more than one). Here are some of his best shots. We live in a Built Green townhome at High Point. I plan to certify our deck as a backyard wildlife habitat, since it provides all 4 necessary components of life: feed, water, shelter, and nesting habitat. My goal is to help the entire neigbhorhood become certified (like Tukwila has the whole town certified). Our last home, on 1/4 acre lot, was certified by both Washington state and the National Wildlife Federation, and was a pesticide free zone as well! This turn-key home leaves you guilt-free when adding your personal touches. Merely decorate—or manifest your dreams with some hard-core remodeling. Near Kubota Garden in the Upper Rainier Beach neighborhood of SE Seattle. On bus route 7, convenient to new light rail station, downtown, Tukwila, Renton, airport, etc. Built with pride in 1945. Step light on the Earth and live in a “recycled” home! 2 bedrooms, 1 full bath, 1090 sq ft fin, 1780 sq ft total. Partially finished basement, extra finished space. New gas furnace, cabinets, fresh paint. Refinished hardwood floors. 2 fireplaces. 2 garages – 1 attached, 1 detached. Corner level lot, approx. 6,000 sq ft, fully fenced back yard. Martha Rose was interviewed recently for a local news story about her newest development in Shoreline, called Queen City Eco-Village. I met Martha when touring this project a year ago with my Built Green certification class, when one of the homes was mostly complete and the others still in progress. I noticed right away the Smart car in one of the garages, which actually was a carriage house with a full apartment above. Her Smarty was “grey market”, from Canada, before they were available in the US. I wanted one. Martha is all about the details. She showed us the many construction particulars that she focuses on that sets her apart from many builders, and is a fine example of how to implement the Built Green Checklist. She is about building a healthy home – healthy to build during construction, and healthy for the family who is going to live there later. All of the Queen City homes are occupied – Martha even lives in one of them. She said she wanted to experience the lifestyle so she could learn about what other things might benefit home owners in the future. I saw the story on NWCN. You can watch the video here. The printed article is here. If you are interested in buiying a green home, it is best if you speak with a real estate agent who has been trained in green homes and can help you properly value the benefits and features of green homes when preparing your offer to purchase your next home. I hold the designation of Built Green™ Certified Professional: Real Estate, or you can peruse the Built Green™ member list to see if your preferred agent is a member. You will see both Green Spaces Real Estate Blog and my brokerage, GreenWorks Realty, are on this page – one right after the other! I am proud to be a part of both. Just listed Friday! Xocai Healthy Chocolate gift bags to card-carrying agents. This is a turn-key home that also leaves you guilt-free when adding personal touches. Merely decorate—or manifest your dreams with some hard-core remodeling. Near Kubota Garden in the Upper Rainier Beach neighborhood of SE Seattle. On bus route 7, convenient to new light rail station, downtown, Tukwila, Renton, airport, etc. 2 bedrooms, 1 full bath, 1090 sq ft fin, 1800 sq ft total. Partially finished basement, extra finished space. New gas furnace, cabinets, fresh paint. Refinished hardwood floors. 2 fireplaces. 2 garages – 1 attached, 1 detached. Corner level lot, approx. 6,000 sq ft, fully fenced back yard. Great segment on the Today show this morning, check this out. I have a smudge stick…I need to get a bell. I have a new listing out today! !